A fully automated approach to account security that lets your good users shape the risk models. Castle's suite of security tools are built for one single purpose – protecting your users. 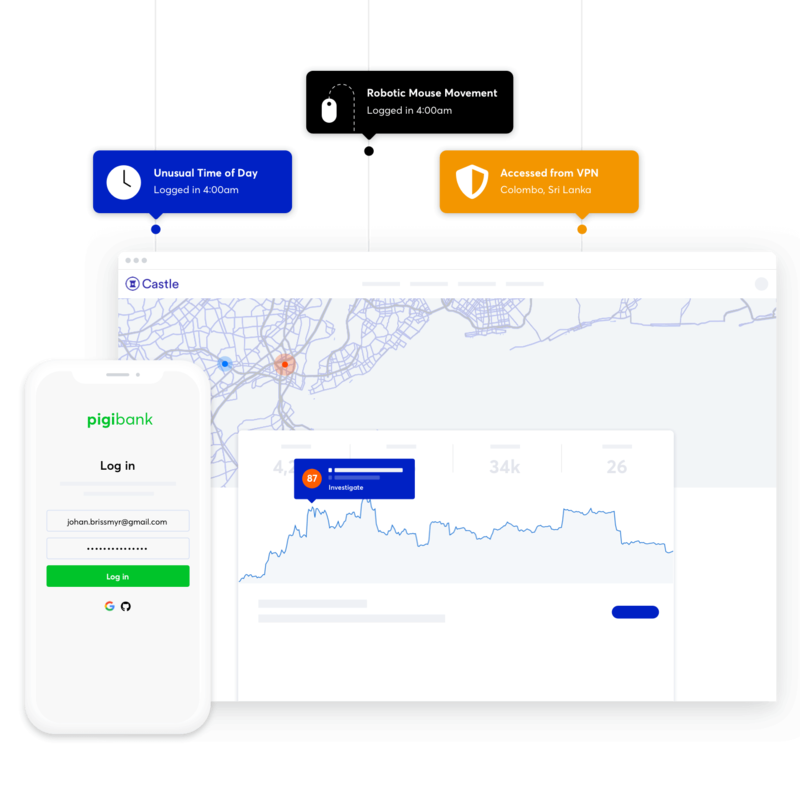 Detect automated credential stuffing attacks and human-powered account takeovers, automate the recovery process, and breathe easy with zero false lockouts, support queues, or angry tweets. From credential stuffing botnets to manual takeovers, turn on AI that scales naturally to protect your growing environment. No lockouts, complaints, or drops in your core business metrics. Automate a process that works for your app. Get transparent insights into every threat signal, risk score, and event tracked per device within a user’s account. Deconstruct Castle into basic blocks to secure any UX your team dreams up. Security as a user experience. Sites and applications that utilize Castle are in a better position to protect, defend, and look out for their users. Our objective: Make it easy for all developers to take on a guardian role. Castle's free trial and entry level plans allow any online business to offer bank-grade account security. No on-prem installations. No single points of failure. Castle’s developer-first platform is built by, and for, those who want to REST easy. puts verdict[:action] # => "allow", "challenge" or "deny"
Try the first end-to-end solution to account takeover prevention.